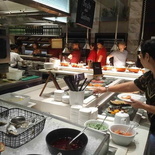 Marriott Cafe is an international hotel buffet located right in the heart of Singapore Orchard road. 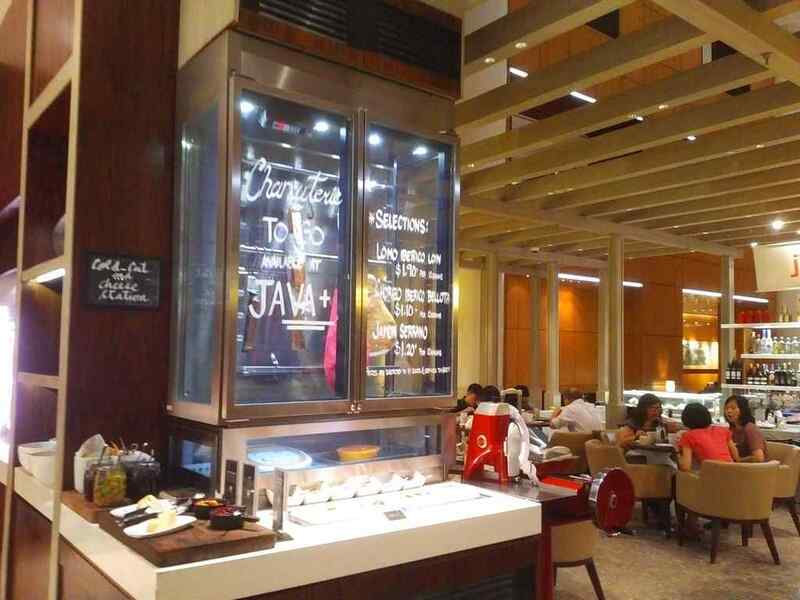 The restaurant sits on the ground floor of the Marriott Tangs Plaza Hotel tucked behind the hotel lobby cafe. 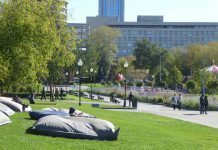 It is accessible from the expansive hotel lobby. It is vast and is quite a joy to hang out here. Notably, such large lobbies are a sight very rare nowadays in hotels in Singapore. Entrance to the Marriott cafe from the hotel lobby. Furthermore, seating is offered through free standing tables or seating booths. The general ambience of the restaurant is cozy. Going with oriental theme, it decorated with lanterns and patterned carpets. 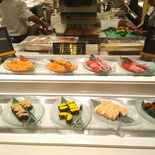 Greeting you right at the entrance of the restaurant is the seafood, Sashimi and sushi selection. 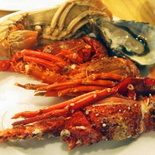 Seafood selections comprises of baby lobsters, crayfish, fresh cooked prawns and fresh oysters. They are separated in weaved baskets placed over a bed of ice. 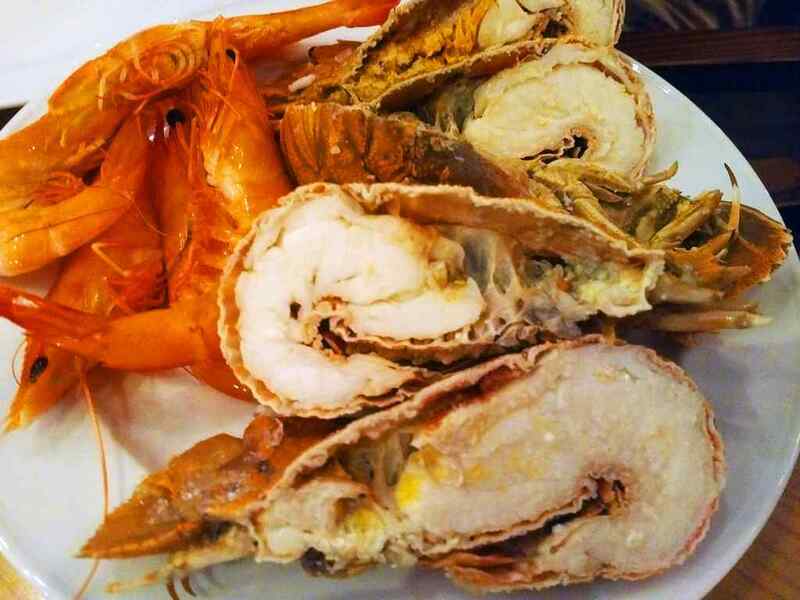 Most of the seafood appears fresh. The baby lobsters are really good and get my recommendations. 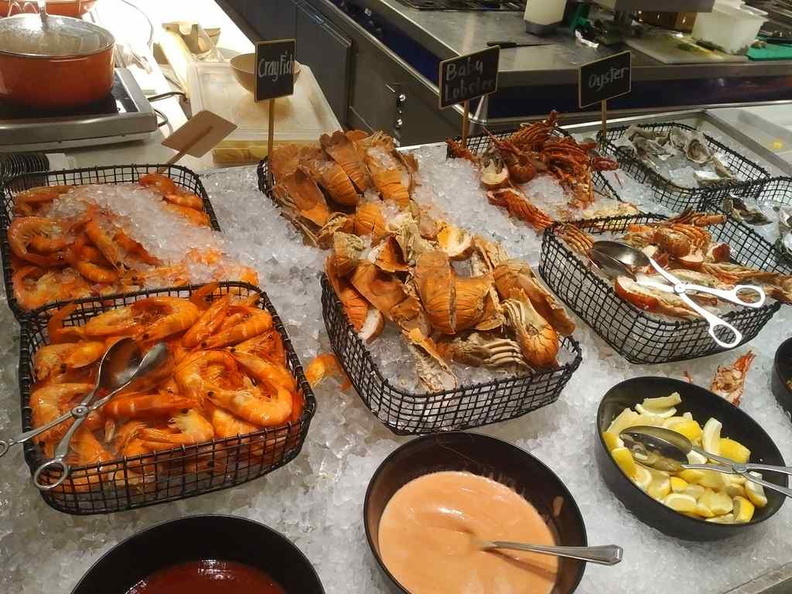 The seafood basket counter. 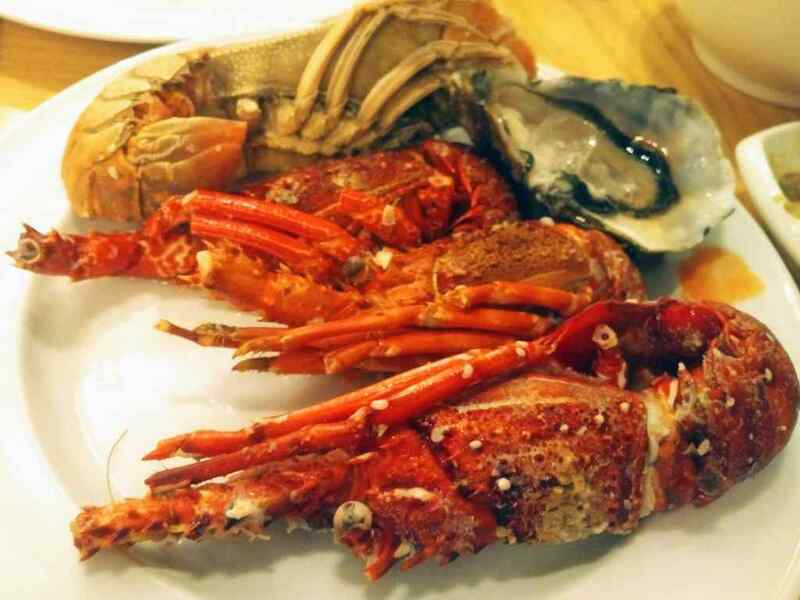 here you have offerings of crayfish, prawns, lobsters and oysters. They are always kept well replenished. 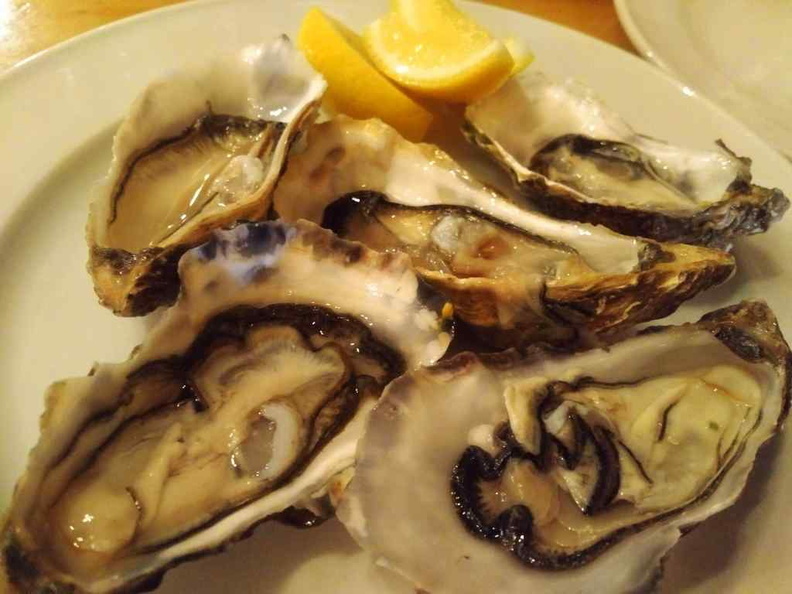 Additionally, there are Fresh Oysters offered on the seafood section too. However, they run out pretty quickly. They restaurant does a good job in ensuring they are always replenished if need be. An empty basket? Just let the staff know. Fresh Oysters from the seafood counter. However, the crayfish during my visit were not as fresh and mostly were soft and mushy. 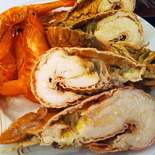 Despite a similar price point, there is no soft shell or Alaskan crab like those offered by Food Capital. 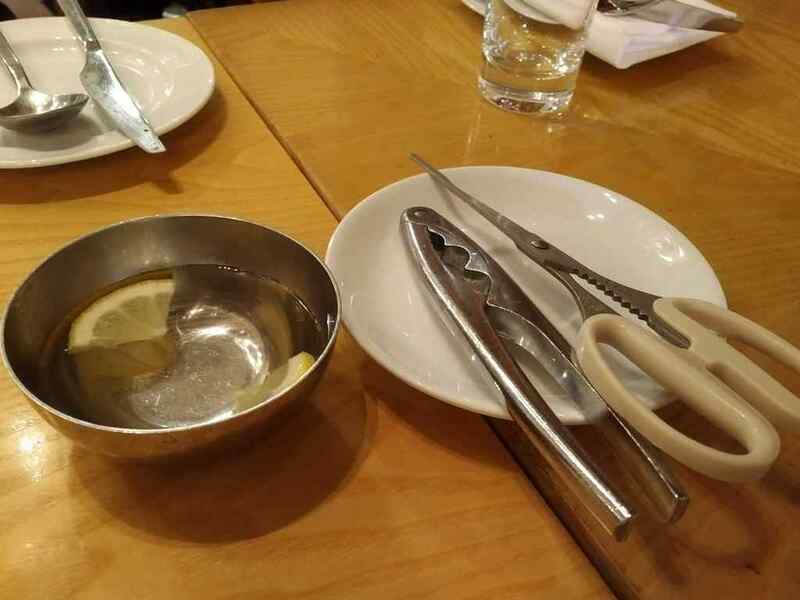 Commendably, your tables are served with seafood cutlery. A pleasant touch indeed. Beside the seafood counter is the Sashimi and Sushi counter. 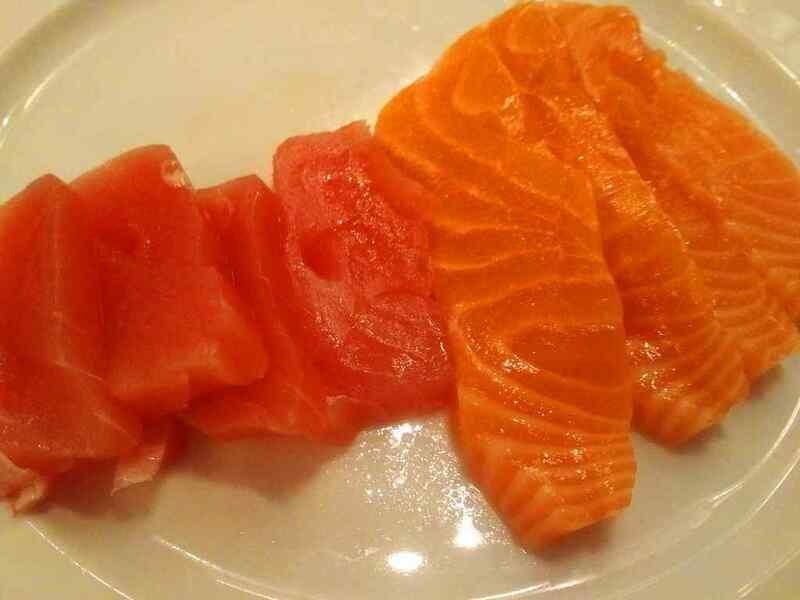 The Salmon and Tuna are generally fresh, but are quite mushy and not quite the quality I was looking for. 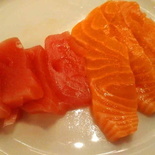 Sushi selections comprises of your mainstream selections of Nigiri, Maki and Tamago. The variety is is nothing too great to scream home about, but still a welcome. Also, the selections are replenished really regularly. 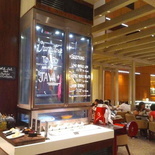 Moreover, a large central island sits in the center of the restaurant. Buffet food offerings surrounding a central open concept kitchen. 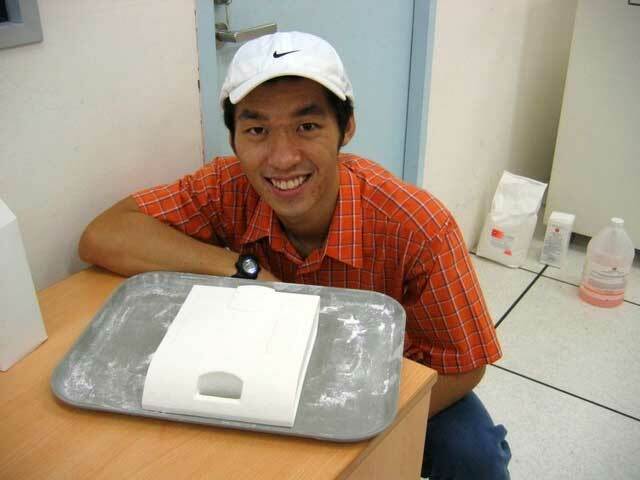 This allows staff to be in the center of attention and able to quickly see which dishes needs replenishing. The restaurant central food island, where the staff are at the center of attention at the food counters. Also here, you can see various members of kitchen staff preparing the dishes. 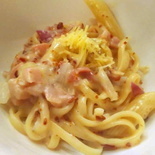 If you need help from a member to staff to prepare counter food dishes (e.g. pasta or Chinese noodles), just give them a wave and the staff will come to your assistance. 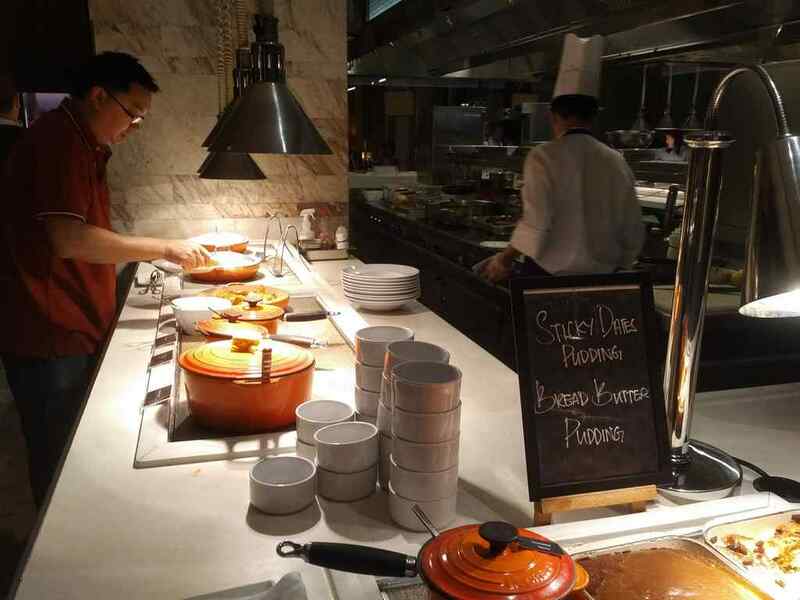 Additionally, Asian Chinese dishes makes up most of the buffet’s cooked food section. 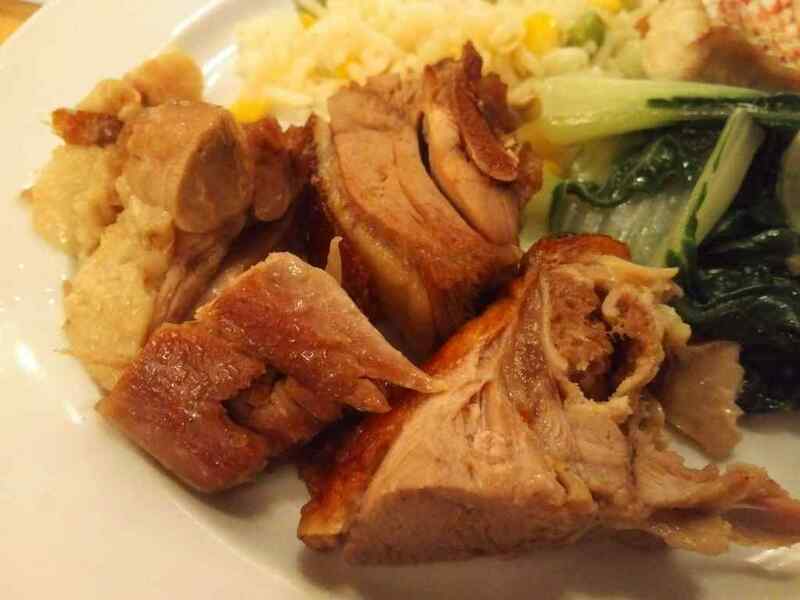 Selections include a Chinese Roast duck and chicken section, as well as a self-help noodle section. Also, their cooked food section is more palatable if you demand traditional Asian staples. 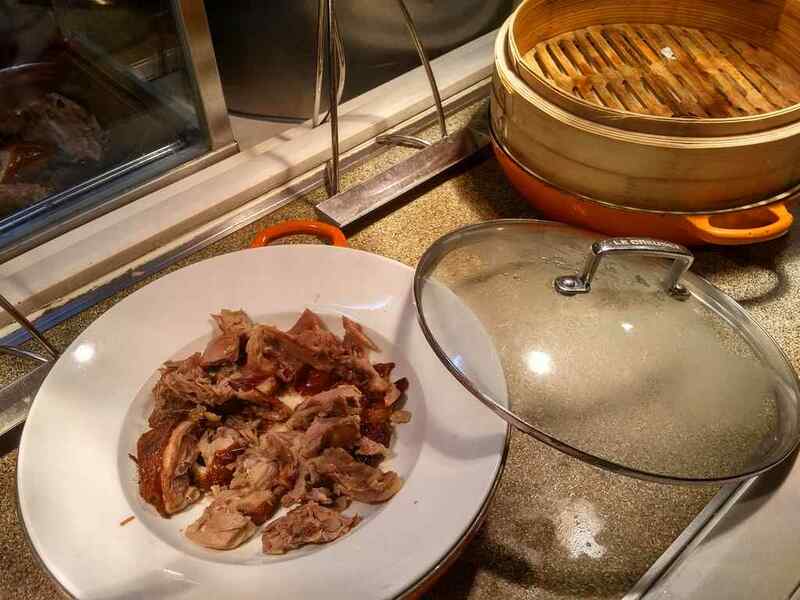 Interesting items include their roast Duck, though I found it too bony for my liking. http://Various Chinese and Indian cooked food. 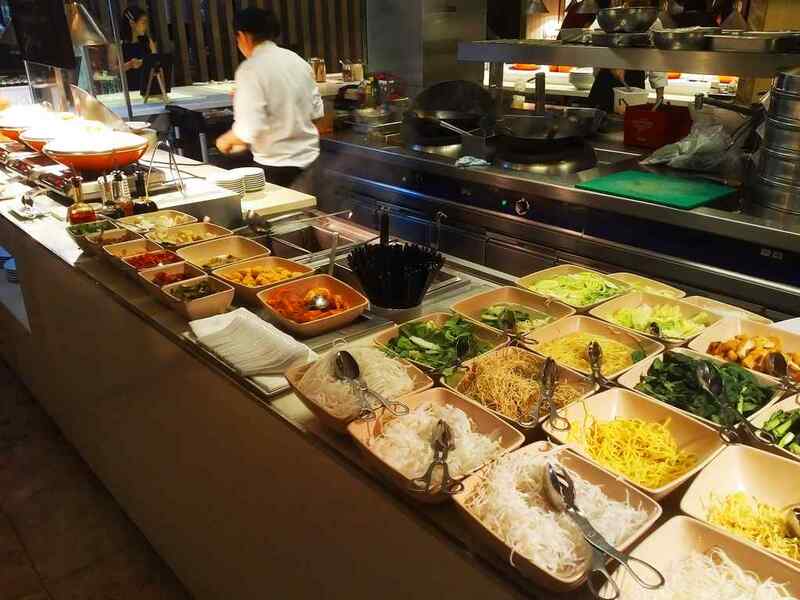 On the noodle section, here, you pick your noodle and ingredient portions which you pass to a counter staff to prepare into a soup bowl. 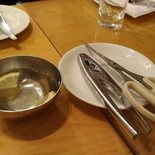 Moreover, you have a choice of 3 different soup bases ranging from chicken, prawn and miso. I would recommend the miso base. Also, you can mix and match the ingredients of noodle types (about a hearty 6 different types), and vegetables. 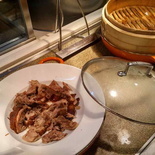 After your dish is prepared, you can add on additions ingredients such as mushrooms and garnishes. Topping up the cooked food is a small Indian section. In contrast, it comprises of a small section of curries, Biryani rice and grilled chicken. The chicken though is tad too dry to my liking. 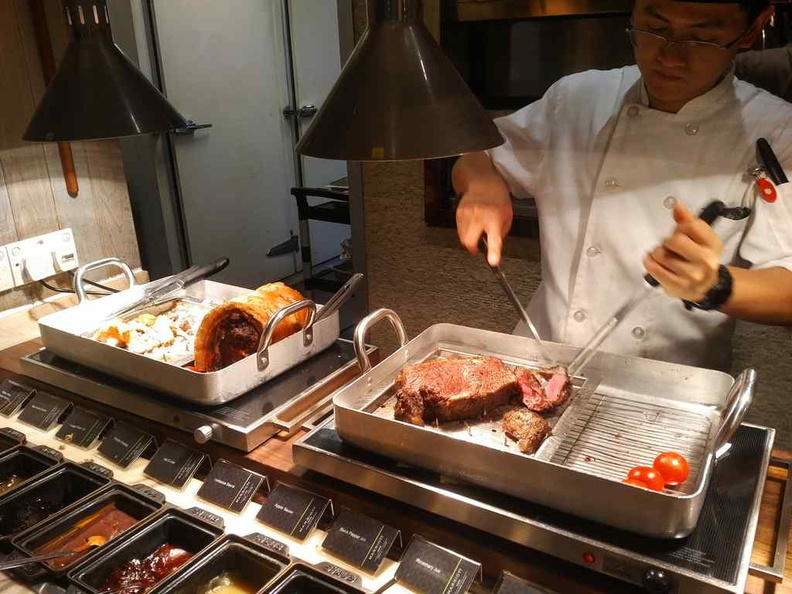 Furthermore, the grill section is one of the gems of the restaurant. It is pretty inconspicuous too, despite the offerings it provides. 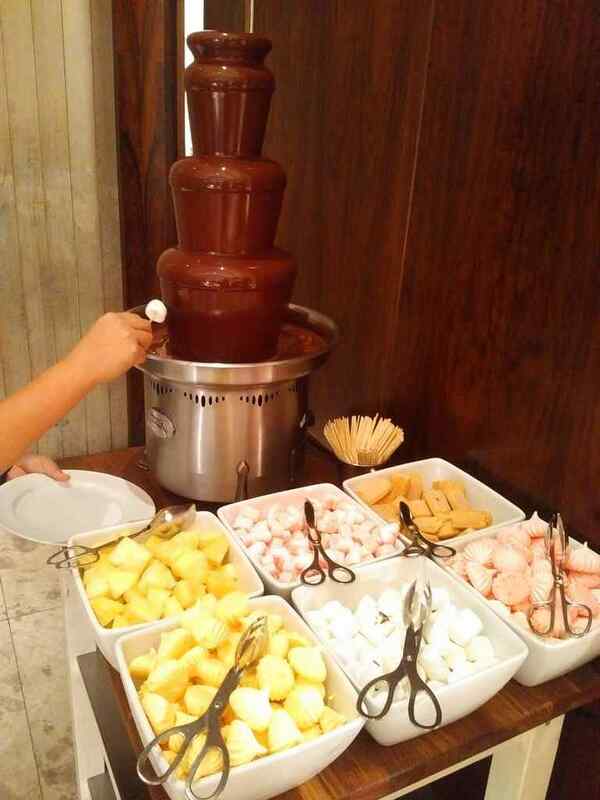 It is placed like a hole in a wall tucked at the corner of the restaurant beside a fondue station. 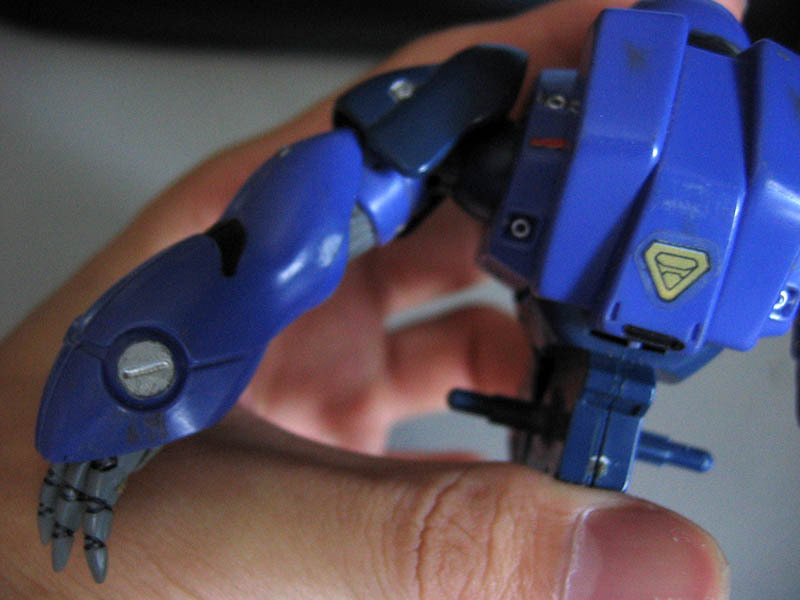 However, don’t let its small size fool you. 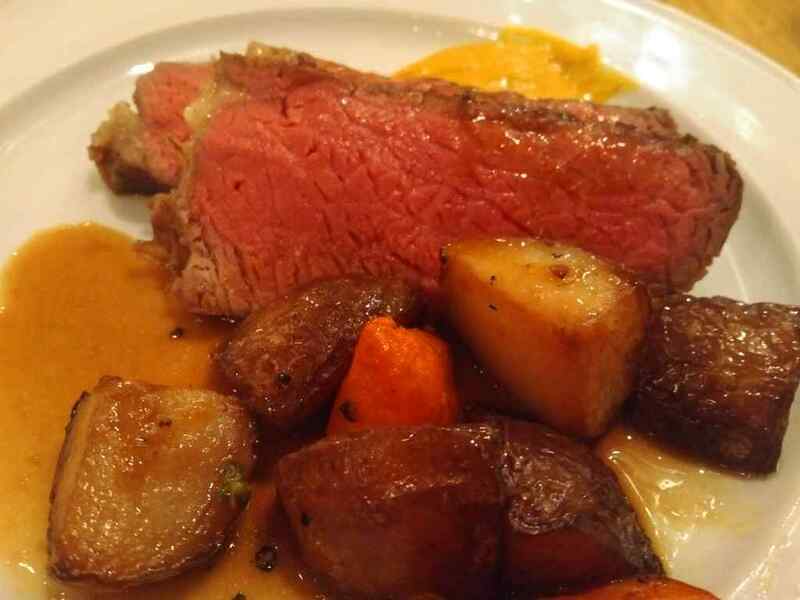 It is one of the best go-to food stations if you are into western roasts. The Roast section. You have a choice of pork and steaks. Additionally, the roast is really good, there are 4 selections here and they all have my recommendations. 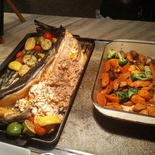 They have Beef steaks done in medium rare, pork knuckles, grilled salmon and grilled mixed country vegetable. 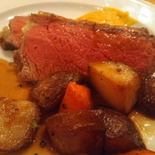 The beef steak is recommended and is paired well a sizable selection of a variety of sauces. You have a large selection of sauces to go with your grill. Notable, choices include herbal, standard brown sauces to jams to go with lamb. Notably, though, there wasn’t any lamb offered during my visit. 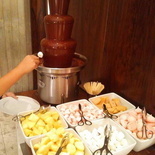 A chocolate fondue sits beside the roast section which seemed quite out of place, offering marshmallows and small bites. 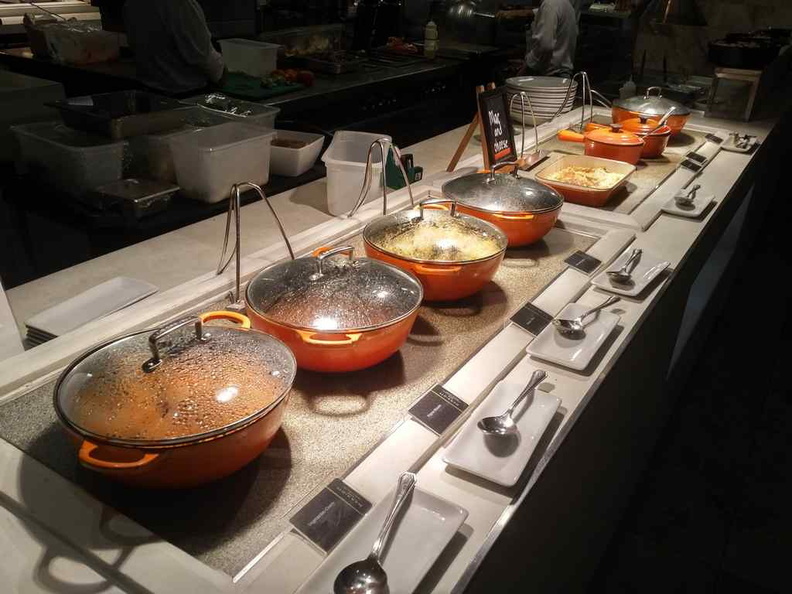 The buffet European section is pretty small, but packs quite a punch with their Spanish Paella. It is quite a potpourri of rice and seafood. 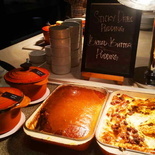 It is cooked well and definitely one of the recommended dishes to try in the buffet. Commendably, its gets replenished regularly. 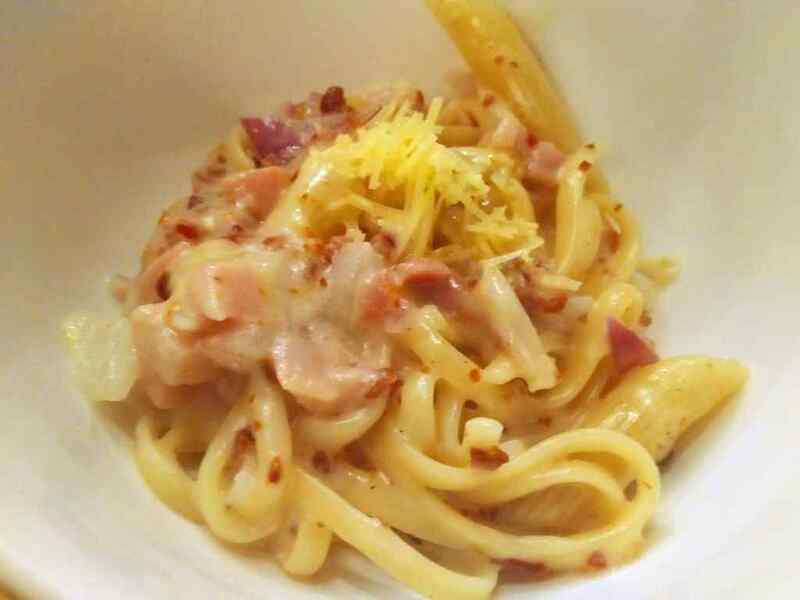 Moreover, the Pasta section is one where you can mix and match your pasta servings and ingredients of choosing. The counter staff will cook your pasta to your sauce of choice. Additionally, the Bread counter has an assortment of bread laid across a vertical shelf with a cutting board for you to slice off your portions. You can pair it with a choice of two soups. 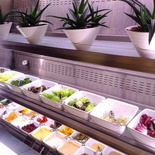 Their Salad counter is a rather joy for anyone looking to build a fresh salad of your choice. Not limited to vegetarians or vegans. 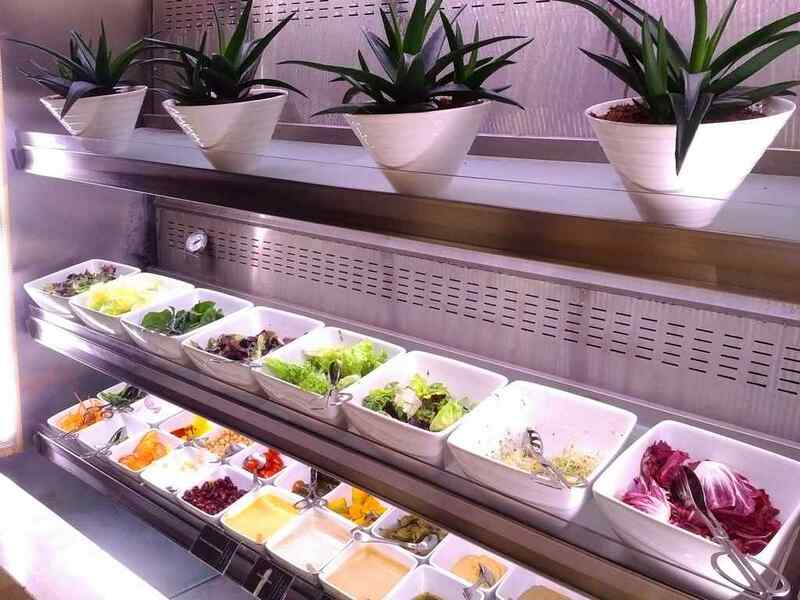 You have two shelves of succulent crisp and fresh greens coupled with condiments like raisins and nuts as well as a selection of salad sauces. 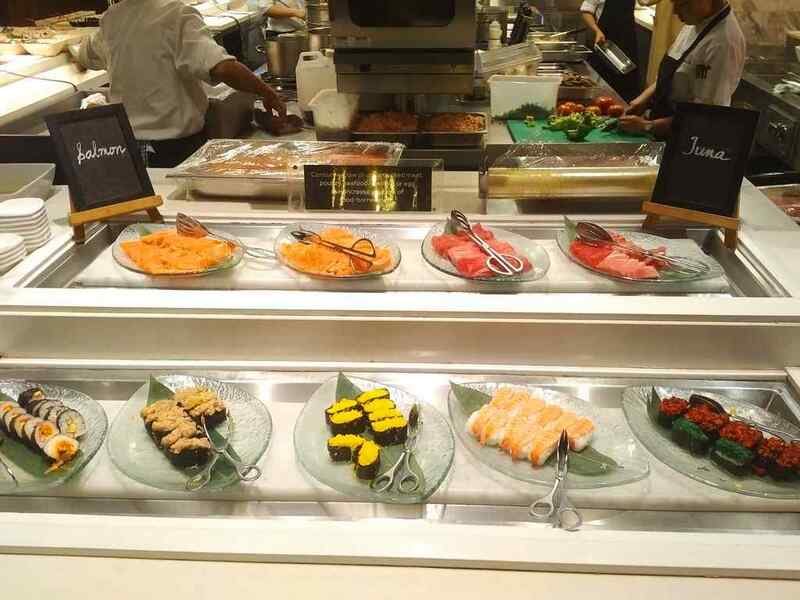 It is one of the freshest selections I had seen in a buffet. Two types of dessert pudding! 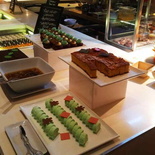 Topping up the selections is Marriott Cafe dessert section. The selection is small, but I found it rather adequate after a hearty meal. You get premium Ice cream in 5 different flavors including mango and cookies and cream on top of the usual chocolate vanilla and strawberry flavors. 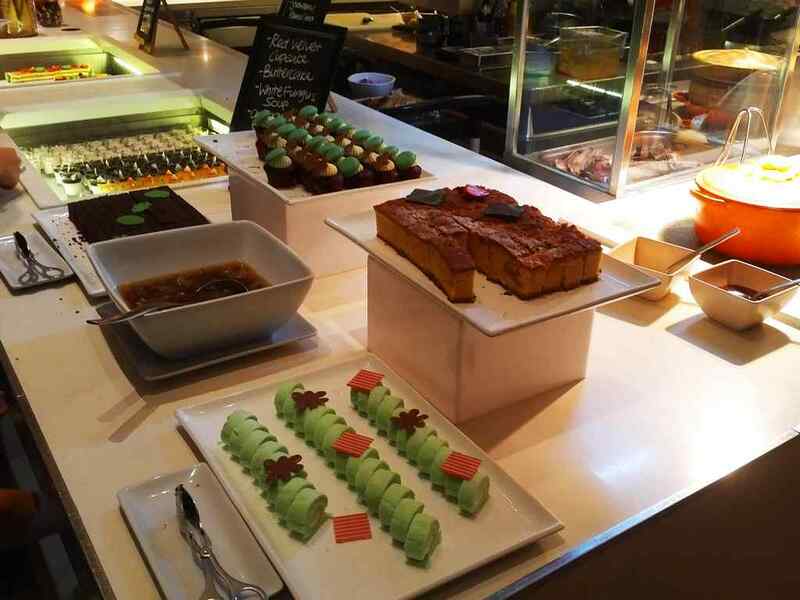 I recommend their desserts mini-cups, they are kept in a counter with a mixed assortment of fruits and cakes. 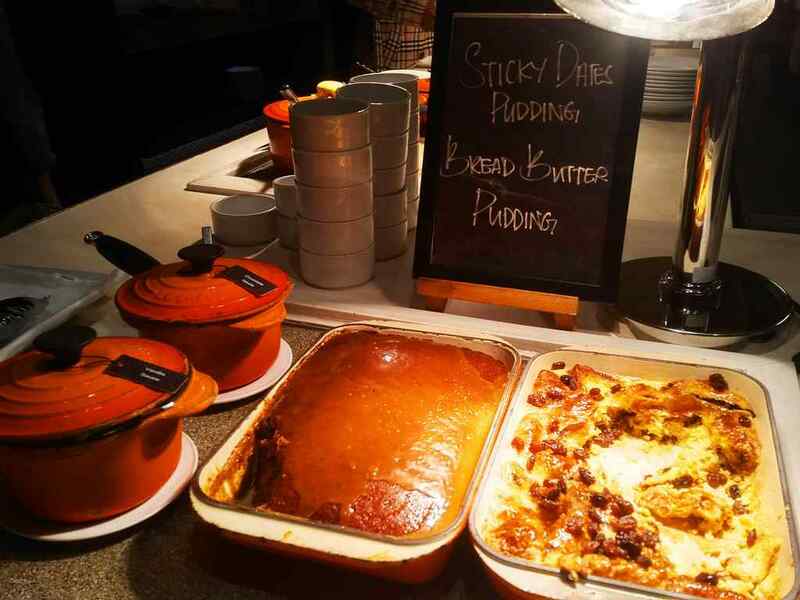 You can pair it with custard pies and a chocolate fondue near the roast section. Notably, the buffet has no drinks or tea counters. However, you can order them at request for teas from the servers. Other drinks such as soft drinks, beer or wines are also available and cost extra. 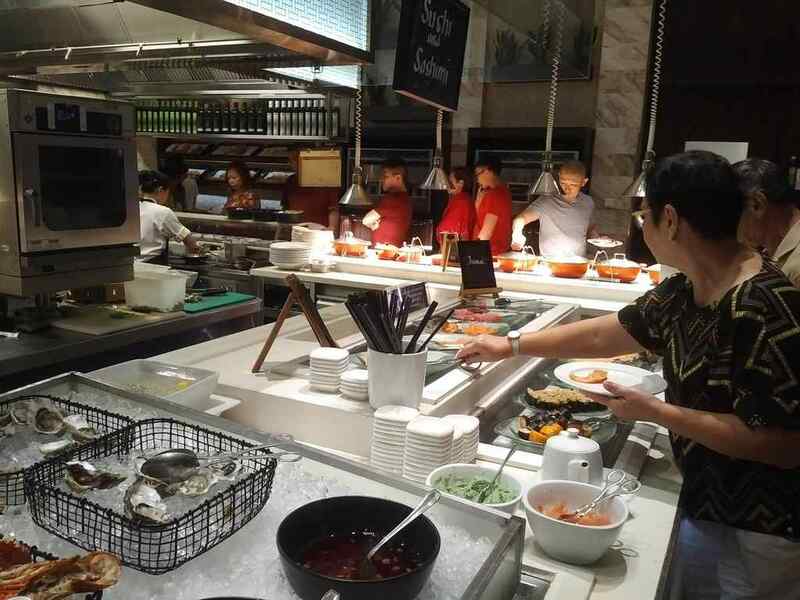 Marriott Cafe Staff are attentive and are quick to clear your plates the moment you leave your seat for more food. 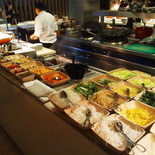 Furthermore, a thing I like about Marriott cafe is that their staffs are always constantly replenishing the food throughout the evening, even towards the restaurant closing. This is commendably good service. 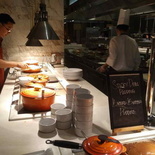 It is unlike several buffet restaurants which stop serving items the moment they run out of food. 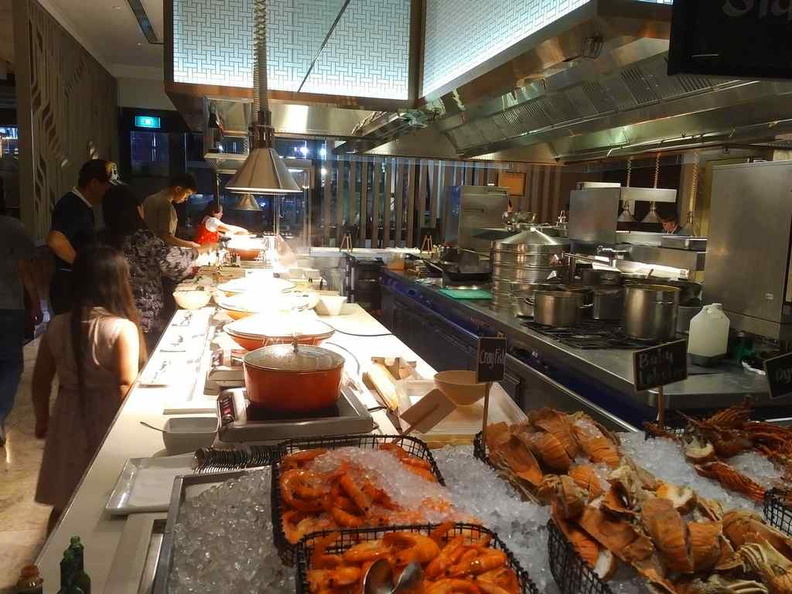 Notably, bad examples of such restaurants includes Triple Three at Mandarin and Royale at Bugis, where the restaurant starts closing food counters even hours before closing the moment food runs out. 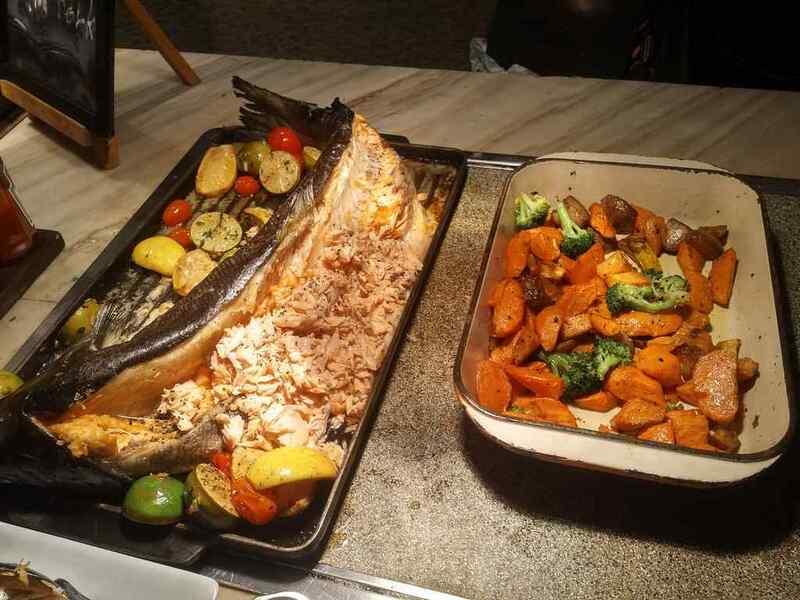 All in all, wrapping it up, Marriott Cafe is a great buffet place for a dinner out right at the heart of Orchard road. The quality spread is large enough that I never had the need to revisit any of the food booths. The seating ambience is pleasant, large and spacious. The restaurant does reservations. Though dining at the restaurant typically cost about $90++ per head, you can snag a 50% discount using online offers. 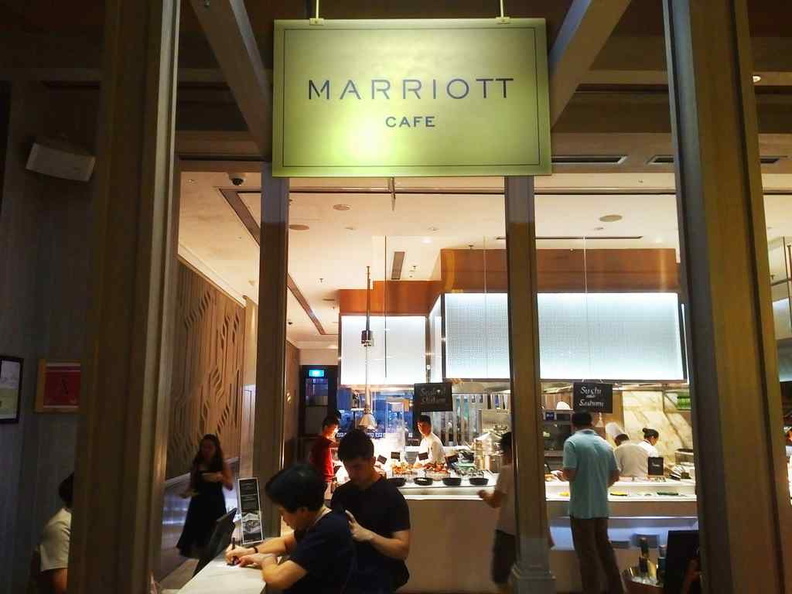 Marriott Café does run 1-1 or 50% off bill offers with Chope or Credit cards, so it pays to check out these offers before you visit.